How many parents and children remember their teachers? How often do they express appreciation for the knowledge teachers have imparted to them? Indeed, how many teachers rededicate themselves to the task of their noble profession? I once took a group of students to India. We also visited Panipat, the native city of my great-grandfather Khwaja Sajjad Hussain (son of Maulana Altaf Hussain Hali), who was a graduate of Aligarh Muslim University. The British governor of the United Provinces called him and three other graduates and told them they were assured jobs in the government; they only had to select the department they wish to work in. One selected the civil service, the second the revenue department, while the third opted for police service. Khwaja Sahab chose education. The governor warned him that education is a poorly paid and tiresome profession, but he insisted on education. At the age of 45, he took early retirement from government service, and used his pension to build a school for boys. The school, named Hali Muslim High School, still stands in his native city of Panipat, though it is now called Arya Samaj School. The principal told me that if Khwaja Sahab hadn’t built the school, many a young boy would have been denied a good education. 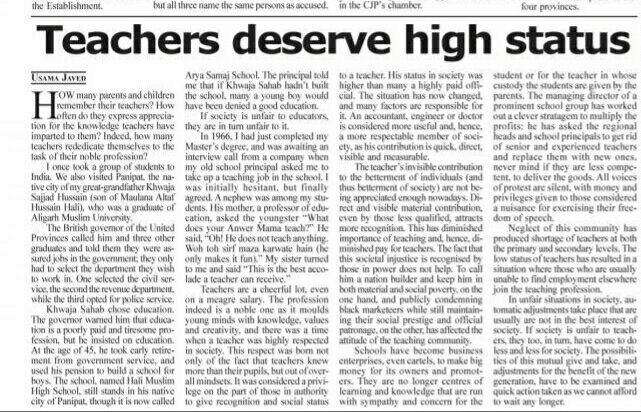 If society is unfair to educators, they are in turn unfair to it. Teachers are a cheerful lot, even on a meagre salary. The profession indeed is a noble one as it moulds young minds with knowledge, values and creativity, and there was a time when a teacher was highly respected in society. This respect was born not only of the fact that teachers knew more than their pupils, but out of overall mindsets. It was considered a privilege on the part of those in authority to give recognition and social status to a teacher. His status in society was higher than many a highly paid official. The situation has now changed, and many factors are responsible for it. An accountant, engineer or doctor is considered more useful and, hence, a more respectable member of society, as his contribution is quick, direct, visible and measurable. The teacher’s invisible contributions to the betterment of individuals (and thus betterment of society) are not being appreciated enough nowadays. Direct and visible material contributions, even by those less qualified, attract more recognition. This has meant diminished importance and, hence, diminished pay for teachers. The fact that this societal injustice is recognised by those in power does not help. To call him a nation builder and keep him in both material and social poverty, on the one hand, and publicly condemning black marketeers while still maintaining their social prestige and official patronage, on the other, has affected the attitude of the teaching community. Schools have become business enterprises, even cartels, to make big money for its owners and promoters. They are no longer centres of learning and knowledge that are run with sympathy and concern for the student or for the teacher in whose custody the students are given by the parents. The managing director of a prominent school group has worked out a clever stratagem to multiply the profits: he has asked the regional heads and school principals to get rid of senior and experienced teachers and replace them with new ones, never mind if they are less competent, to deliver the goods. All voices of protest are silent, with money and privileges given to those considered a nuisance for exercising their freedom of speech. Neglect of this community has produced shortage of teachers at both the primary and secondary levels. The low status of teachers has resulted in a situation where those who are usually unable to find employment elsewhere join the teaching profession. unfair situations in society, automatic adjustments take place that are usually are not in the best interest of society. If society is unfair to teachers, they too, in turn, have come to do less and less for society. The possibilities of this mutual give and take, and adjustments for the benefit of the new generation, have to be examined and quick action taken as we cannot afford to wait any longer.